December 14, 2017 - Jim Dabney has been selected as one of Law360's 2017 MVPs, a distinction that recognizes elite attorneys with successes in high-stakes litigation, complex global matters and record-breaking deals. 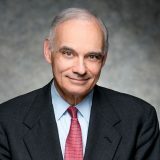 Dabney, along with the other MVP winners, was chosen out of more than 1,000 nominations for having led liquid sweetener maker TC Heartland to victory before the U.S. Supreme Court in a case that challenged the Federal Circuit's broad interpretation of the patent venue statute and upended nearly three decades of established practice in patent litigation. A Dec. 14 profile noted that, in the unanimous May decision, the justices rejected a rule that effectively allowed patent lawsuits to be filed anywhere a defendant does business. The high court ruled that lawsuits must be filed where the defendant is incorporated or has a regular and established place of business. "Any Supreme Court case is going to tend to be important, but this is one where it affects almost every patent case," Dabney told Law360. The profile also noted that TC Heartland marked the third time that Dabney has won a Supreme Court reversal of a Federal Circuit decision on the issue of patent law or procedure. Dabney said that, in the last two decades in particular, he has come to believe there is instability in patent law that grows out of conflict between Supreme Court and lower court precedent. "It was that perception on my part that led me to teach a course on the subject at Cornell University Law School and make a career out of adding to the usual tools of the trade and the knowledge of this body of Supreme Court patent precedent that for too long, was not really paid much attention to," he said.